Gerard Hudson was born in Brighton August 1 1874 and grew up at No 9 The Drive in Brighton. He was the son of Reverend Robert Hudson (1836-1907) and Marian (Fisher) and shared the house with seven brothers and sisters. Reverend Hudson was Honorary Chaplain to the Royal Alexandria Hospital at Brighton (now the Brighton Children’s Hospital) from 1874 to 1878. He was also a Justice of the Peace for Surrey from 1857 to about 1882. Gerard studied Electrical Engineering, left England and ended up at Koffyfontein in South Africa where he worked as an Engineer at the local Diamond Mine. Here he met his wife, Florence Emma Osborne, and got married on 24 July 1907. They had five daughters born from 1908 to 1921. Gerard became Assistant Mine Engineer and retained this position until he resigned in 1913/1914, his resignation prompted by a keen interest in aviation and desire to build his own ‘flying machine’. 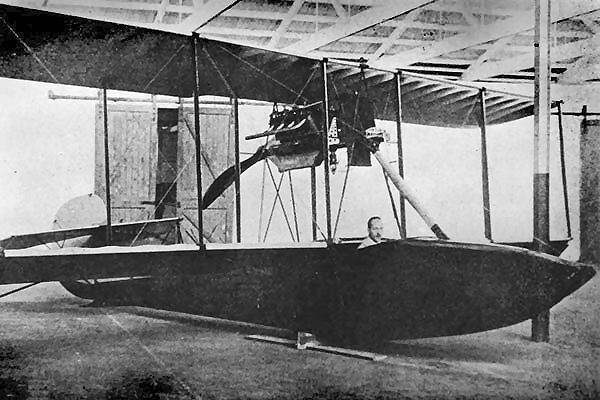 Instead of building his own however, Gerard briefly returned to England during December 1913 and purchased two Curtiss Flying Boats (F Boats) for use as a novel attraction during the Gala Season back in South Africa. Gerard never piloted the aeroplanes and employed Londoner, Dennis Cutler, for the flying, initially in Cape Town and later in Durban. The pleasure-flying was short lived however as the planes were acquired by the Royal Navy just after the outbreak of WW1 for aerial spotting over the delta of the Rufiji river in German East Africa. A modern, shallow draught German cruiser, the SMS Konigsberg, used the delta as a refuge, could not be reached by the ships of the Royal Navy and had to be monitored by way of the then novel practice of aerial spotting. Cutler and Hudson’s Flying Boat served the Navy well, it’s success directly responsible for the delivery of several, more suitable and powerful aeroplanes to the area for use in spotting and bombing during the remainder of the war. What was left of the F Boats was returned to Gerard after the war. Gerard Hudson died in South Africa on 13 June 1948. Regrettably very little information and in particular photographs, exist of Gerard. The attached image of him was obtained from one of his daughters, the location or date of the picture unfortunately not recorded. The uniform suggests that it was taken in the UK. He may well have been a member of one of the local Regiments or Guards. Any further details, information and pictures of Hudson will be much appreciated. Even advice on where or whom to contact for leads tracing his early years in Brighton or later life in South Africa will help me record the important role this man from Sussex had played in indirectly establishing aerial reconnaissance as an essential part of warfare. I don’t want to sound like a know-all but the suggestion that the uniform is from a local Regiment is way off beam. The kilt suggests that this is the uniform of the Black Watch, but there are several Highland Regiments in South Africa ie The Cape Town Highlanders and The Cape Town Field Artillary. As I am not an expert on all things Scottish please treat this as an observation. Thanks John…your observation seems to be spot on. I have had a good look at an enlargement of the image and the Regimental badge appears to almost exactly match that of The Black Watch. None of South African Regimental badges seem to be of similar design. I have sent the enlargements of the photograph to The Black Watch Regiment for comment and will post their reply upon receipt. I’ve received the following reply from the Archivist at the Museum of The Black Watch: “I have searched the Officers’ Rolls but have not traced a listing of Gerard Hudson. 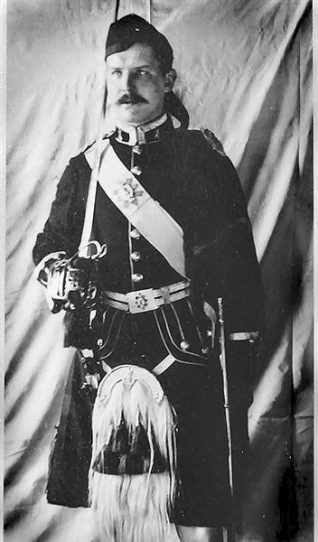 The photograph shows a man in the uniform of an officer of The Black Watch. In review order. However, there is no Regimental badge on the Glengarry. He would appear to be in his late twenties? This would date the photograph early 1900s. Was he always based in Brighton? You may be able to trace a service record at the Public Record Office at Kew, London. Another source would be the Annual Army Lists”. So I am afraid nothing new….the search for further information on Hudson therefore continuing. Hi Frank. Just a quick note. I have just done a google on the Cape Town Highlanders and have seen that they wear a similar regimental badge to the Black Watch and the tartan of the Gordon Highlanders. If you can get a closer look at the kilt we may be on the right track. Hope this is of some help to you. I am his great-granddaughter. It is fantastic to see this. My gran used to talk about him all the time. This is great Deborah. Which of Gerard’s daughters is your Grandmother. Gladys Adelaide, Kathleen Dorothy, Enid Constance, Ruth Florence, or Mary Joyce HUDSON?